Martha was a maker. She was preparing the evening meal when her sister Mary disappeared to go hang with Jesus. And Martha got mad. The fish needed broiling; the fire sent sweat pouring down her face. Thank goodness she’d made fig cakes this morning, but would he mind bread a few days old? Well, it would have to do–but Jesus was no ordinary guest. While she slaved, Mary kept glancing over her shoulder, but no Martha, no Martha, no Martha. 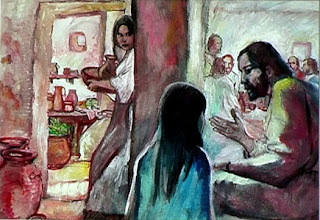 Finally she stormed into the room where Mary sat at Jesus’ feet, listening avidly. “Make her help me!” Martha snapped, sure Jesus would see what was the Christian thing to do. Jesus told Martha she only needed one thing–spiritual time, AKA reflective and quiet time–which is exactly what Mary had already figured out. Jesus told Martha that what Mary had would never disappear. In other words, the “slacker” had it all figured out. This parable always irks me because I’m a doer. In this story the doers lose. 100% Virgo, I waste no time getting about my business. Down time seems gratuitous; let’s just say I don’t give myself much time for daydreaming unless it’s permitted by schedule–a mind wandering during the commute, though I’d do better to listen to NPR; waiting in a doctor’s office, but I could be working on a short story. Every hour could be better used to get something done. Obsessed, workaholic, intense, I expect a lot out of me, every day. At ease. At peace. Thoughtful. Dreaming. I recently parted ways with my agent, amicably, because despite all my best efforts at doing, I could not create a novel that met the market’s formula. A certain profile of 16 year-old girl was my agent’s aim, and understandably so: many publishers need a story that sells easily, the “easy on the eyes” formula. And ironically, to get to that easy sale some of us must slave. More irony: I actually think this draft is the best yet, but I haven’t taken time away to make a better judgment. So, despite all my hard work, I can’t yet tell you what I have to show today. I wonder if the people I know who have less of an agenda and more of a dream are truly the winners in this life. I mean those who laugh and love and don’t stress about whether the goals are checked off on the checklist. If they show up fully present to each moment, they may gain more wisdom in an hour than I might get in a lifetime. But the nagging Martha voice does whisper in my ear: what would Jesus eat if it weren’t for her? Who keeps those trains running. I love this blog because it forces me, Martha, to sit still and reflect. How can you get the job done without work dominating your days? How do you find joy in the moment and put your list aside for enough seconds so you can experience what’s dancing right in front of your nose? How do you not care so much about things that could be easily taken from you? How do you live in the present without forgetting your obligations to others? How do you give in to the energy of now without becoming the kind of person who lives off others’ hard work? How do you know what is “the good part” to invest your time in rather than something that is illusory? And beyond any assessments of American character and way of life, the fact is we can judge till the cows come home, whether we’re the cow chaperones or not, but you can’t live your life in harsh judgment of others. You can’t stay angry and bitter over who’s doing or not doing their fair share or whether you just did yourself wrong with all this flurry of activity for nought. All I know right now is this: there can be no bitterness as I walk away from a long period of making art–perhaps unsuccessfully by market standards. Today there should only be sitting at the feet of Wisdom to figure out what the heck just happened. What about you: are you consumed with Making something or Taking it all in today? Thank you, Lyn. I agree that the makers and takers dichotomy is, in the end, a false one. And sometimes our annoyance with the “others” comes from our profound fear that we wouldn’t be acceptable if we were not doing it “our way.” It takes a lot of practice to both release our grasping and embrace how we’re made. Your work ethic is a gift AND you are not the only one helping to shape and inform your past, present, and future. So, keep up the good work AND enjoy–and in the midst of it all breathe in the promise of being able to relax into who you were made to be. There really is no “other,” is there–try as we might to separate into feuds and factions. We are all Mary and Martha inside. Relaxing, acceptance–wise advice!